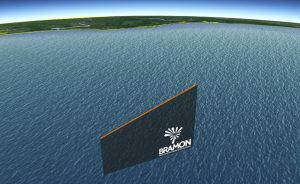 On March 24, 2019, just before 7:00 PM local time, BRAMON began to received reports from the state of Santa Catarina that noticed what appeared to be the passage of a bolide toward the ocean. The reports was sent to our fanpage, to our group on Facebook and to Report a Fireball site (in partnership to AMS). 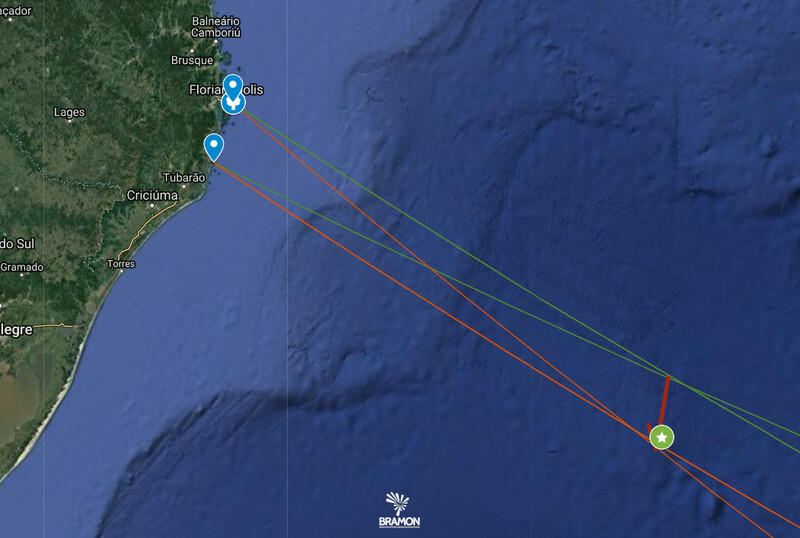 One of the BRAMON members in Santa Catarina, Rafael Bernadino, is also an administrator of the Conexão Geoclima page and was collecting reports from there. It was not long before two videos showing the passing of the meteor appeared. Being one from the city of Florianópolis-SC and other one from Imbituba-SC. 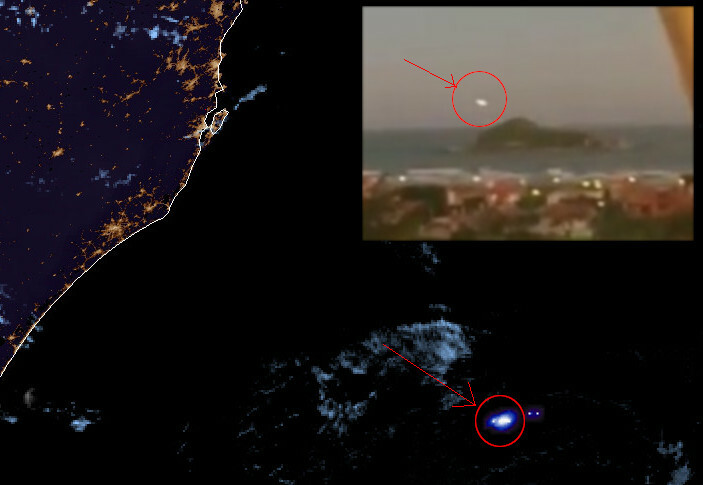 The analysis from these two videos, show us that the meteor occurred far away from the coast. This information was confirmed from the images of the GOES – 16 satellite, which showed a flash about 550 km from Florianópolis. This flash was occurred at a time compatible with the reports and in the location near of where the triangulation of the two videos pointed. The video recorded in Imbituba-SC, from the balcony of an apartment, has clear references that allowed to correctly calculate the parameters of the passage of the meteor. However the video recorded in Florianópolis-SC, on Joaquina beach, does not have so many references. We still managed to extract azimuth and elevation data for the initial and final points of the bolide, evidently with a greater margin of error, but which allowed us to calculate the trajectory and confirm that the glare observed in the GOES – 16 satellite was really bolide. After analyzing the satellite images, Dra. Rachel Albrecht of Department of Atmospheric Sciences of the IAG/USP noticed that there were no clouds capable of generating electric discharge in that area and confirmed that the flash could only be generated by the passing of a meteor through atmosphere. The calculated trajectory indicates a North to South displacement direction. Due to the high margin of error of the Florianopolis data, it is possible that there is a small variation of the initial point to east or west. The calculated initial altitude was 59.3 Km and the final altitude was 32.92 Km. The meteor displaced with an average speed of around 17 Km/s and at an angle of 18 deg related to the surface. See below the projection images of the meteor trajectory for each point of view. The searching data process and analysis of this bolide was discussed in a Live in which we participated in the Space Today channel, on March 25, 2019, which can be seen in the video below. We are still working to improve the accuracy of analyzed data to determine the impact energy and consequently the mass of the object. An estimate from the already calculated images and data is that the initial mass should have at least 1 tonne. 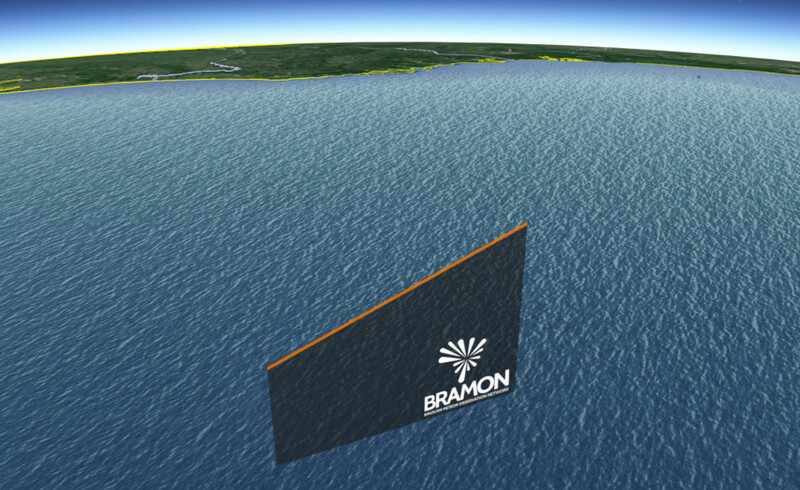 BRAMON continues to seek new data and information to better understand the event. As soon as there is news of this case, it will be disclosed here.